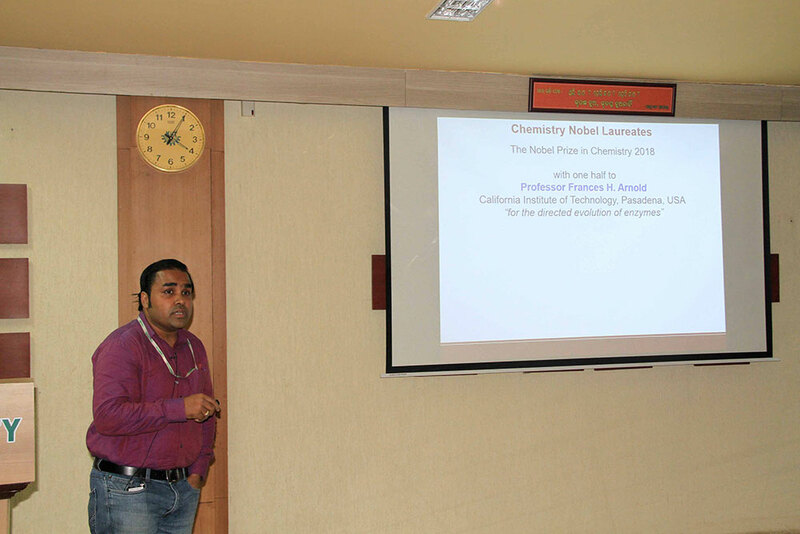 A popular lecture on the Nobel Prize of Chemistry 2018, was organized by KIIT School of Applied Sciences on 22nd January 2018, the third in the series. The main objective of the lecture was to understand the chemistry behind the directed evolution of enzymes and for the phage display of peptides and antibodies in a simple way. Dr. Alok Kumar Panda, Assistant Professor, Chemistry, delivered the lecture outlining the simple principles of the protein engineering and its wide ranging impact. The 2018 Nobel award winning research in Chemistry harnessed the power and principles of evolution of genetic change and selection in developing engineered proteins which are yet to solve a diverse array of chemical problems. These engineered proteins and enzymes are helping to make the chemical reactions eco-friendlier and solving many problems in healthcare, pharmaceuticals and sustainable energy etc.